Just now I received an email from someone, he concerned once Writing Outliner Word add-in is installed, will it get in his way when he is not working on documents that need Writing Outliner Word addin. Your outliner looks very promising, but I’m wondering if after installation Word will always start with it or is it possible to have the options for a clean startup and a startup with the outliner? I’m new to Word addins. The answeris: No, Writing Outliner will not get in your way when you don’t need it. Look the screenshot below, it only shows a small vertical strip on the left of your Microsoft Word main window. Why this UI design instead of using a Ribbon item (or a toolbar/menu item in pre-2007 versions of Microsoft Word)? Because you can recall it with just one-click! 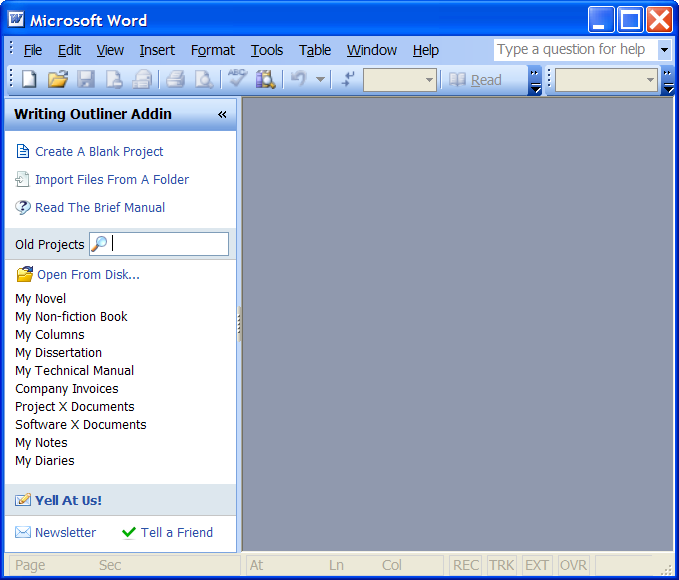 Background: Writing Outliner is a Microsoft Word addin that is intended to make writing book-length documents in Word easier, by adding various functions (such as edit multiple documents in the same time, view and search research materials/notes, etc) to Word. It’s currently under development. You can sign up for the newsletter to get informed or become a beta tester. Start from now, as the development goes I will post some screenshots of Writing Outliner Word addin, to show how it makes writing easier in Word. Once Writing Outliner addin is installed, you will see the Welcome pane showing on the left in Word’s main window, as you can see the above screen shot, Writing Outliner is seamlessly integrated into Word. Like Word’s built-in ‘Getting Started’ task pane, the Welcome pane of Writing Outliner addin helps you to get your writing projects started easily. On the top you can click ‘Create A Blank Project‘ to create a blank writing project, or click ‘Import Files From A Folder‘ to quickly create a writing project by using your existing documents, researches and notes, this is extremely useful because you must have already a lot of existing documents written in Word or other writing programs, or you can just use this function to import all your documents froom ‘My Documents’ just to utilize the full text search feature of Writing Outliner addin. In the middle the Welcome pane lists all your existing writing projects for your fast and easy access, you can even instantly filter the project list by name, what you need to do is to input a string in the search box. On the bottom of the Welcome pane, some links are provided for sending us questions and feedbacks easier. From the screenshot above you can see that Writing Outliner addin is not only good for writing book-length documents, but is also good for all kinds of writings including, but not limited to columns, thesis, technical manuals, project documents, software development documents, diaries, and so on.